Put the power of boat restoration in your hands! The DeWalt DWP-849X Marine 31 Boat Oxidation Removal Kit is the serious choice for professional detailers who are looking for a combination that provides serious results, time and time again. This is because the DeWalt DWP-X Variable Speed Polisher is the latest edition of DeWalt's legendary 849 series of rotary polishers. These machines are heralded for their �impossible to break� durability and �big block� 12-amp motors. The DeWalt DWP-849X Marine 31 Boat Oxidation Removal Kit combines this polisher with Marine 31's eco-friendly Gel Coat Polishes and Lake Country Pads to give you an unbeatable combination sure to restore the shine on any boat surface! To protect the shine you have created, the Makita 9227C Marine 31 Boat Oxidation Removal Kit includes Marine 31's Carnauba Wax + Sealant and Wax & Shine Detail Spray. These ecologically friendly products will help you keep your boat looking great no matter the sea's that lay ahead. The DeWalt DWP849X 7�/9� Variable Speed Rotary Polisher offers DeWalt's monster 12 amp motor in a light weight, ergonomic design. The DeWalt DWP849 has a CFS Controlled Finishing System with soft start to ensure a gloss finish. It is the perfect tool for auto detailing and restoration, metal and concrete finishing. The Lake Country 6 Inch Rotary Backing Plate works with the DeWalt DWP-849X in this kit to securely mount 6.5 inch and larger polishing pads. The molder urethane lip gives this backing plate just enough flexibility to contour to any curves you may encounter while restoring your boat's finish. Marine 31 Gel Coat Heavy-Cut Oxidation Cleaner is the first step in restoring neglected marine gel coat. Marine 31 Gel Coat Heavy-Cut Oxidation Remover quickly cuts through deep oxidation and removes hull scuffs and scratches from all gel coat surfaces. Proprietary diminishing abrasives work quickly, while Marine 31's advanced lubricant system provides a long buffing cycle and minimal dusting, even in the Florida sun. Use with the included Lake Country Orange CCS Pad to quickly remove moderate oxidation or the Lake Country Twisted Wool Pad to remove severe oxidation. Marine 31 Gel Coat Final Step Polish is a fine cut polish designed to refine your boat's gel coat and produce a brilliant gloss. Marine 31 Gel Coat Final Step Polish is perfect as the final step in restoring your boat's finish or as a maintenance polishing step when you desire more gloss. Marine 31 Gel Coat Final Step Polish removes wash scratching, buffer swirl, mild oxidation, old waxes, and light stains. 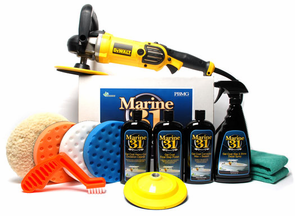 Marine 31's advanced lubricant system provides a long buffing cycle and minimal dusting, even in the Florida sun. Marine 31 Gel Coat Wax & Shine Detail Spray is a high-lubricity formula designed to remove fresh water spots, salt-spray, oil, film, bird bombs, and liquid spills that occur during normal use. Marine 31 Gel Coat Wax & Shine Detail Spray penetrates between dust, grime, and light contaminates so they can safely be removed without scratching or dulling the surface. This shine-boosting detail spray instantly revives a dull finish and replenishes your existing wax protection. Marine 31 7.5 Inch 100% Twisted Wool Cutting Pad is the perfect first step solution to heavy oxidation when combined with Marine 31 Gel Coat Heavy-Cut Oxidation Cleaner. Use this to cut through the thickest oxidation, remove scratches and dock marks, and restore a shine to neglected gel coats. The Lake Country CCS 6.5 Inch White Heavy Polishing Foam Pad is a firm polishing pad designed to polish away the fine marks left behind from the previous step of polishing. When used with Marine 31 Gel Coat Final Step Polish it will impart an even finish that is free of swirl mark and polishing haze. The Foam Pad Conditioning Brush is designed to clean wool and foam pads quickly so you can get back to polishing with minimal interruption. The thick plastic handle is angled so you can hold it comfortably in your hand while you clean your pad. Don't let caked on residue ruin your polishing, brush it away!